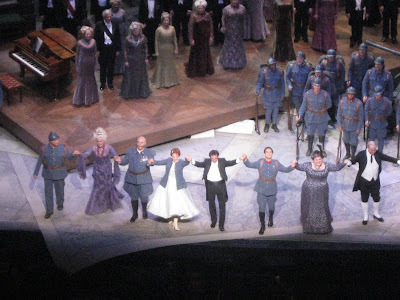 I really love Donizetti's romantic comedy opera La Fille du Regiment at the Metropolitan Opera. It's the sweetest of love stories - young love and parental love. The music is light and beautiful. This production also includes spoken dialogue (in French), which makes it seem very much like musical theatre. It's about a young girl who has been adopted by an entire regiment of the French army. They are protective and sweet with her and it is understood that she will grow up to marry one of them. As she begins to blossom, she meets Tonio, a local Tyrolian boy. They fall instantly in love. In order to marry her himself, he joins the regiment. But their plans are foiled when her long lost mother, a marquis, swoops in and brings her home to be married so she may save her estate. Tonio, along with the entire regiment, save the day in the end and young love prevails. When Sally and I heard that Diana Damrau would assume the role of Marie, the "daughter of the regiment", while Juan Diego Florez would reprise the role of Tonio, we knew we'd have to add it to our season list. 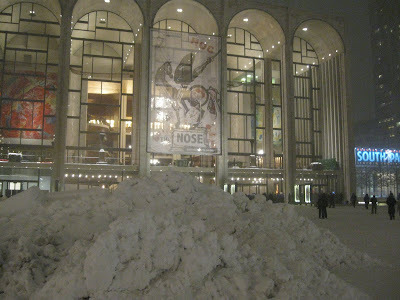 Even more thrilling, Kiri te Kanawa would be back on the stage of the Met Opera, even if it was in a non-singing role. But voila, Kiri did sing as the Duchess! What a thrill to hear her beautiful voice. At 65, she is still one of the most glamorous opera singers with a gorgeous voice that rang to the rafters of the family circle, even though she hasn't sung an opera there since 1998. At first she just hummed along with the violin solo, but in a moment of high comedy, she pulled a piece of sheet music out her sleeve for the conductor. She sang Ginastera’s “Canción al Arbol del Olvido” to a very appreciative audience. She also delivered a very funny and very wise line, in English, "Don't be stingy with the Dom Perignon." Diana Damrau was wonderful. Although it appears she's working a little hard at the comedy, her soprano is nothing short of exciting. Her Marie is as lovely as any and its thrilling to hear her in the role. Juan Diego thrilled us again with his nine high c's that seem as easy as pie. He does make the heart pound. Overall it was a satisfactorily fun evening at the Met, although I did miss the delightful chemistry and hilarity of Natalie Dessay, Felicity Palmer and Alessandro Corbelli who I saw previously.